Eminence’s Basslite Series bass guitar woofers feature extremely strong, yet light-weight, neodymium magnets that are as little as one third the weight of a standard bass speaker. This can reduce the weight of a typical 8×10 cabinet by as much as 40 to 50 pounds. The 10-inch Basslite models come with either paper, hemp or aluminum cones and cast or steel frames. The Eminence 12- and 15-inch models have paper and stamped frames. Eminence recommends the C2515 15-inch as a replacement speaker for the Ampeg BA115T, Ampeg B200R, Kustom Groove 215H speaker cabinet and the Behringer Ultrabass BXL3000, and the Fender Rumble 100… among other combo amps. 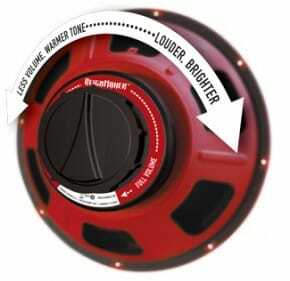 Eminence Basslite S2012 12-inch Bass Speaker delivers full, round bass tone. Ideal in vented 1×12″, 2×12″, and 4×12″ enclosures. Eminence recommends the Basslite CA2010 10-inch as a direct replacement speaker in the Gallian-Krueger Goldlite 410 GLX speaker cabinet, among other speaker cabinets.